Can we expect the vSAN API to be slowly extracted from vCenter and made more “stand alone”? Or is using the vc provided methods still a safe course of action? Already replied to the Reddit thread but I’ll post the reply here as well. vCenter Server is still the recommended solution for managing and configuring your VSAN environment. It goes beyond just initial setup of the VSAN Cluster but also provisioning and integration of the VM Storage Policies in which you can perform periodic compliance checks. 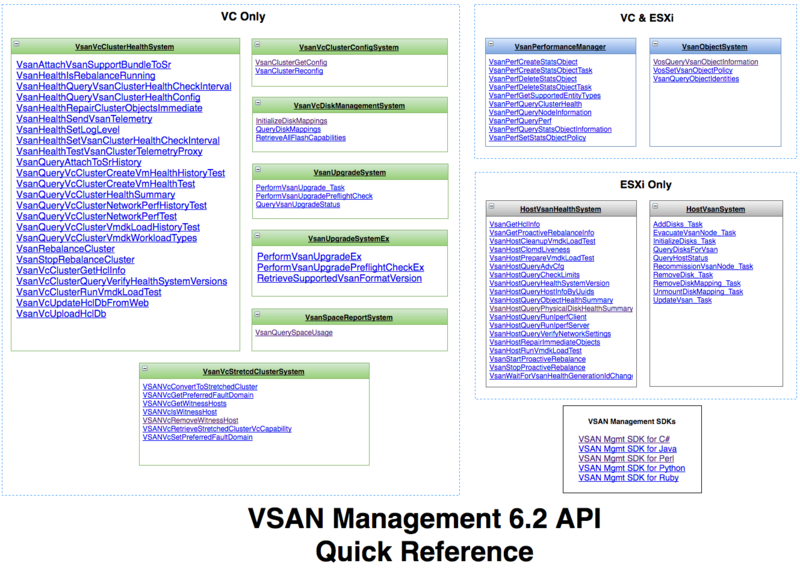 All of these along with many more capabilities are all exposed in the new VSAN 6.2 APIs which are fully supported w/vCenter Server. Having said that, much of the VSAN Management APIs already exists directly on the ESXi host and in fact, you can boostrap VSAN w/o VC as I’ve shown in this article here http://www.virtuallyghetto.com/2013/09/how-to-bootstrap-vcenter-server-onto_9.html Longer term, VSAN will also be able to support nextgen platforms like VMware’s Photon Controller which does not use vCenter Server, so you can see that its been designed to be flexible to support existing customers using vCenter Server as well as platforms like Photon Controller for building Cloud Native Apps.